On April 24, the most deadly factory fire in Bangladesh’s history killed over a thousand garment workers at the Rana Plaza factory in Dakha. The fire, however, is not a unique occurrence in Bangladesh, nor in the garment industry itself, coming only a few months after another Bangladeshi factory fire in November killed over 100 people and another 300 were killed in a factory fire in Pakistan back in September. Blocked off from exits by cramped factory line tables, many chose to throw themselves from the eight-story Rana Plaza building rather than be crushed by its inward collapse. Indeed, though the scale is this time much larger, it is not the first time these sorts of terrible conditions have led to such a tragedy, and many predict it will not be the last unless serious changes are made in the industry. The international community has already begun responding to the accident, but ideas for how to prevent future repeats diverge significantly. The betterment of workers’ rights and safety in the garment industry is not an easy nor straightforward issue to solve, but international bodies, multinational companies, as well as individual consumers should be aware of how their behavior makes a difference, especially when some measures, such as boycotts, may do more harm than help. The European Union, as well as some private companies, such as the Walt Disney Company, have immediately opted toward boycott and withdrawal from Bangladesh. Disney executives, attempting to distance themselves from such disasters, ordered all production of merchandise from Bangladesh to be effectively pulled out, claiming responsibility to stakeholders. The EU, while not quite as drastic as cutting off Bangladesh from their business, has also proposed changing the current status of Bangladesh in EU trade contracts, which give Bangladeshi garments preferential access. According to EU plans, this would put pressure on the Bangladeshi government to change labor standards after negligence played a significant role in the recent fires. Western consumers too have began to wonder how they can wipe their hands clean of the blood the garment industry has spilled over the past few decades. Walmart, H&M, Gap, as well as British company Primark and Spanish label Mango are amongst some of the most popular retailers who manufacture their garments in sweatshops in Dakha. Pick up a few pieces of clothing and you’ll notice the tags: Bangladesh, Vietnam, Cambodia, Sri Lanka and probably many other countries whose laborers manufacture our ten-dollar tank tops, summer dresses, jeans, likely all the while working for meager pay in unsafe working conditions. However, the initial reaction to distance Western companies and consumers from the garment industry in Bangladesh until better working conditions are presented is not only mislead, but may actually cause more harm than help. 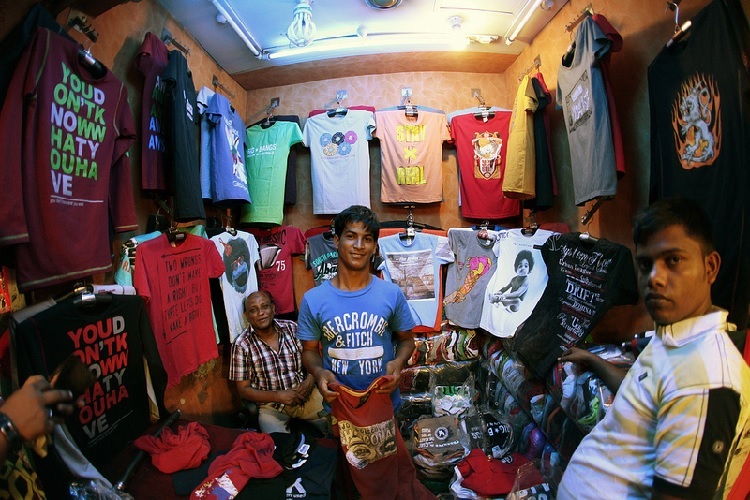 Bangladesh has steadily risen from the 1980s into a strong producer of ready-made garments, with over 80 percent of Bangladesh’s exports accounted for by the garment industry. While still among one of the poorest countries in the world, the opportunity to work makes a significant difference in Bangladeshi lives, especially those of women who account for four-fifths of the garment industry workforce. Women working in the garment industry are able to be more independent and provide for themselves and their families, despite comparably low wages. To close factories, to relocate to other countries, would ultimately end in a tremendous loss of jobs in Bangladesh, forcing thousands of workers relying on factory jobs into poverty. The fact that Bangladeshis and other laborers around the world rely on industries such as the garment industry to make ends’ meet does not, however, necessitate the poor working conditions and low accountability that are the current status quo in the garment industry. A combined effort between multinational companies and the governments of garment industry countries must develop relationships that insure better working conditions for their laborers, improving areas such as oversight, labor standard agreements between multinationals and factories, and improvement of domestic labor standard policies. As slow and complicated as that process might be, major changes must be made from the top down, requiring cooperation, sacrifice and compassion on the part of big actors. Be more than a boycott. Sign petitions. Use social media. Use your voice to let clothing companies know that you demand transparency and high labor standards. Buy ethical brands whose credentials nominate them as brands that respect workers’ rights, environmental policies, and high quality standards. If a popular company has taken a step forward to improve workers’ rights, make sure it does not go unappreciated. Buy from companies who are doing more for workers’ rights around the world. Use alternatives such as vintage and second-hand clothing to supplement, not a replacement for ethical buying. Income levels of factory workers are directly affected by Western consumption, and slowing consumption puts these people at risk. Also be aware of the waste produced by many second-hand clothing stores that can also hold negative consequences in developing countries. Real change is not a straightforward nor easy path, but it must be pursued in a partnership between the labor-exporting multinational companies and the governments of labor producing countries must make the changes. It is also not enough for consumers to forgo shopping at popular retailers in hopes for a better world; real change takes real action, and more importantly real understanding. Boycotts, with all the good intentions in the world are not the answer in the world of improved labor standards. Great article. Too often when disasters such as this occur we (I have also been guilty of this way of thinking) naively think that boycotting the shops concerned is the answer. This article shows that much more can be done by consumers!